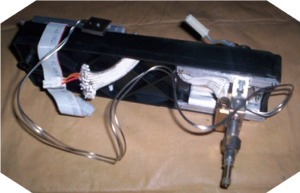 The flame ionization detector (FID) responds to compounds that produce ions when burned in a H1oairflame. These include all organic compounds, although a few (e.g., formic acid, acetaldehyde) exhibit poor sensitivity. Measured at the jet tip. This selectivity can be advantageous: for example, H2O or CS2, used as solvent, do not produce large solvent peaks. The system is linear for most organic compounds, from the minimum detectable limit through concentrations greater than 10% times the minimum detectable limit. Linear range depends on each specific compound; it is directly proportional to sensitivity of the FID toward the given compound. In general, where sample components of interest are in high concentration, increased air flow may be necessary (up to 650 ml/min). Where components of interest are in low concentration, reduced air flow rates are acceptable (375 to 425 ml/min). For maximum sensitivity, it is recommended that a standard sample be made containing components of interest in concentrations expected. By experimenting with different carrier, air, and H2 flow rates, the standard is used to determine flow rates giving maximum response.